So what about sound proofing? Here’s the question we get a lot.. “Does your tank have any sound proofing?” Basically, does the Zen Float Tent cut down on noise during a float? When designing the Zen Float Tent we really focused on a light-weight, thin walled design so it would be affordable, shippable, and easy to move. We want to make floating accessible to the whole world, and that comes with some limitations. Even the most expensive float tanks don’t eliminate sound, they only reduce it. You’ve got to have a quiet setting. Real sound proofing in any float tank comes from the room. 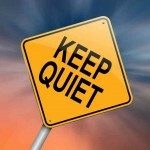 It’s the reason float centers are in quiet locations, and the reason they tell all their patrons to “keep quiet.” It’s all about the room and environment. The best way to have a silent float is to tell anyone in the vicinity that you’re floating. Then they can help keep it quiet. Another big reason sound isn’t a scary issue is because your ears are under water. It really cuts down the sound! I’ve been floating for years and let me tell you.. when your ears are under the water you don’t hear much. Try taking a bath and sticking your ears under the water, you will see what I’m talking about. Not to mention so many floaters use ear plugs. What does get through is the deep thuds, the loud booms, or heavy footsteps. If you can’t get rid of these, you may have problems. Here’s the rule of thumb if you’re thinking if purchasing a tank. Do you have a room and environment you could meditate in without distraction? If you have that.. you can have a successful float there. You can always throw in ear plugs too. At the end, sound is the easiest variable to fix, and with a little creativity you can figure out a quiet setting to float in.